Coco Butternut marks the always-welcome return of Joe R. Lansdale’s dysfunctional duo: Hap Collins and Leonard Pine. As usual, wherever Hap and Leonard go, trouble seems to already be there, awaiting their arrival. And in the case of this twisty, hilarious, and heartfelt new novella, Lansdale sends his heroes to Oak Rest mortuary and cemetery to grapple with the living and the dead—both canine and human. 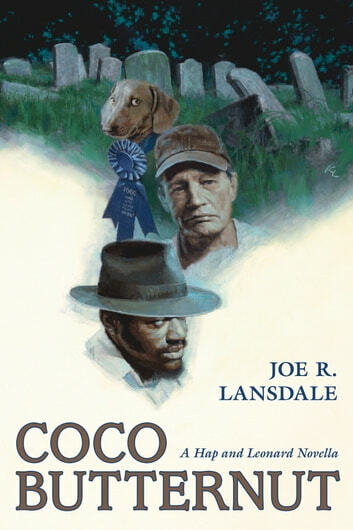 When the mummified corpse of a beloved prize-winning dachshund named Coco Butternut is stolen from her final resting place, Hap and Leonard are hired by the owner to get her body back. The job is straightforward: they must simply exchange a bag full of cash for the missing pooch’s mummy. But they can feel something’s not on the up-and-up, and how right they are. With assistance from Hap’s significant other, Brett, and his daughter, Chance, Hap and Leonard are soon embroiled in a gripping mystery tied to the dark secrets lurking beneath the hallowed ground of Oak Rest cemetery. In his inimitable style, and at the top of his game, here Lansdale gives us a highly enjoyable new entry in the ongoing adventures of Hap and Leonard. Fans of Hap and Leonard’s, whether of their fictional outings or the Sundance TV show (or more likely, both), won’t want to miss this treat. Harry Hid It: But Where Is It?